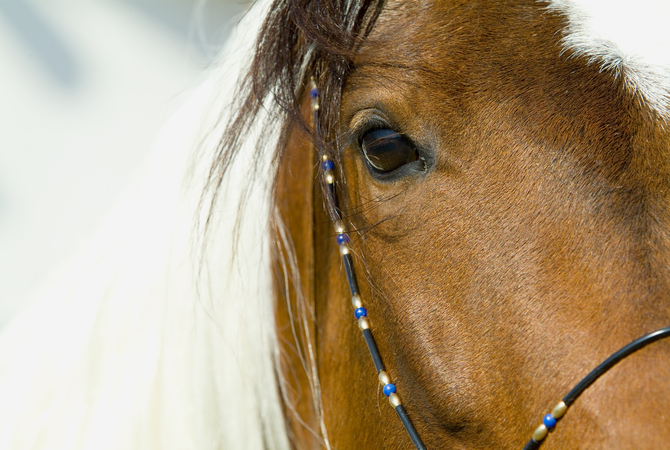 Periodic worming is an important and easy-to-do equine health activity. Before administering any wormer, ask your veterinarian to develop a periodic deworming program for your equines. Your veterinarian may do some testing to see the loading and type of parasites in your herd before starting a program. 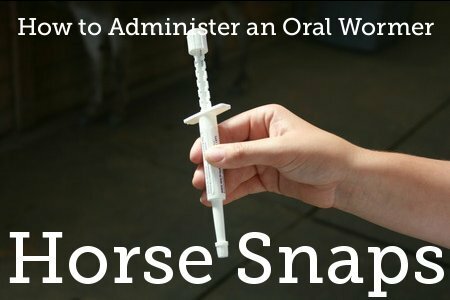 Oral wormers come in plastic syringes that are used for administering the medication directly into the mouth of the equine. Most manufacturers provide a dose for a 1250 pound animal. 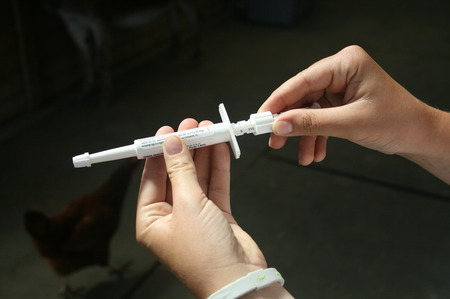 If you have a larger horse, look for higher dosage syringes or you can use two syringes to get the required amount. The dose amount depends on the weight of the equine. In this example, we are worming a Mediterranean donkey, so we need to estimate the weight of the donkey and then adjust the syringe plunger to the desired amount. If you don't know the weight of your equine, use EquiMed's simple Equine Weight Calculator for an accurate weight estimation. 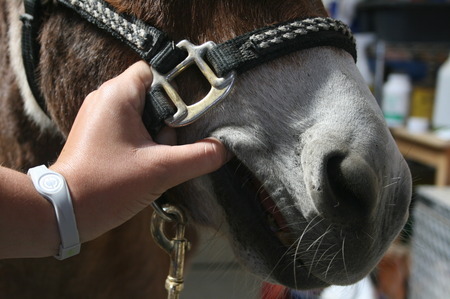 A favorite technique of experienced equine handlers is to use a halter as pictured above. If you are right-handed, grasp the halter with your left hand and carefully insert your thumb in the corner of the animal's mouth. Gently pull the corner of the mouth back to create a space for the insertion of the syringe. Insert the prepared syringe into the animal's mouth and toward the back of the tongue. Depress the plunger to administer the medication. 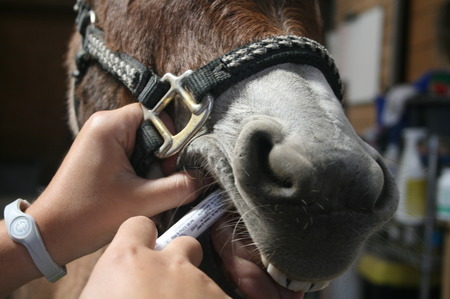 Some equines will immediately put their head down and spit out the medication, so we recommend that you hold the head elevated with the halter for 10-15 seconds after administering the medication. If you want to learn more details about horse parasites and their treatment, we recommend the annually updated Equine Parasites Control Guidelines. Haley is a Senior attending Cal Poly SLO. She is an animal maniac, and is majoring in animal science with a pre-vet emphasis. She posts some of her thoughts in this blog about the life of an undergrad with goals to become a large animal veterinarian. Haley has worked at the Tri-County Veterinary Hospital as a veterinarian assistant during the summer. She currently is doing her internship at Charles Poddock Zoo in Atascadero California. She has a passion for raising and showing animals. She has experience with: horses, cattle (beef and dairy), sheep, goats, swine, dogs, poultry, and rabbits. In the summer, Haley hangs out with her parents and boyfriend in Morgan Hill, California, and enjoys riding her horse Wilbur and spending time working with her other animals.